This fluffy, tender Southern Coconut Cake has a raspberry filling topped with the creamy coconut cream frosting between each layer. 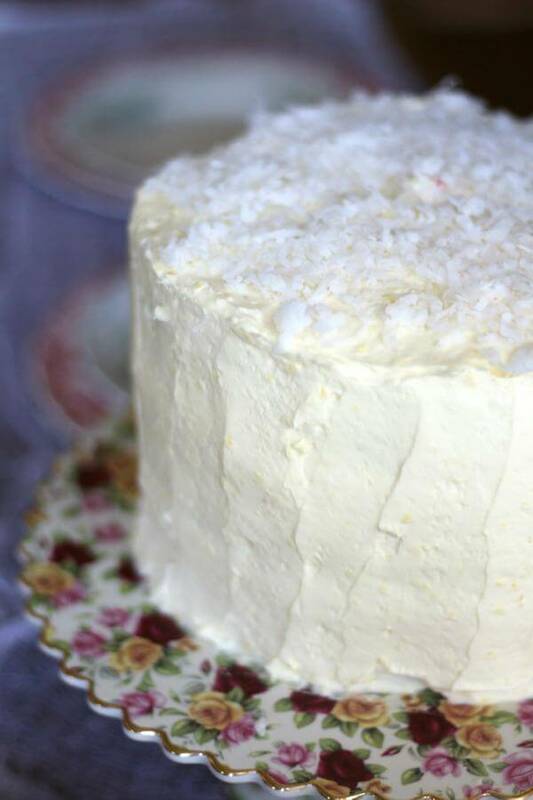 This rich, old fashioned coconut cake is perfect for Easter or any special occasion. You may also want to Check out these Easter Dessert Ideas! Nothing says Easter in the south like a towering coconut cake. It generally sits right next to the banana pudding on the dessert table. You can’t just have any coconut cake — it’s got to be one that tops anyone else’s coconut cake. Southern cooks are very competitive when it comes to cooking and baking skills, in case you were unaware of that fact. Holidays, church potlucks, and family reunions are prime times to show what you can do. Well, if you were to set this cake on the table I’m pretty sure that the competition would be over. I based this on a cake recipe from the 1943 Rumford Complete Cookbook. It’s by the Rumford Baking Powder people and this particular book is the 35th printing! It was first printed in 1908. It’s one of my favorites because there are handwritten notes and recipes all the way through. In fact, the whole reason that I thought of coconut cake was the faded, blue handwritten recipe in the flyleaf — Cocoanut Bars. So, you might be wondering how I could call this a Southern coconut cake when Rumford is in Rhode Island — which is, if you know your geography, no where near the south. Well, the cake recipe wasn’t originally coconut cake – I tweaked and adjusted until I got what I remember a Southern coconut cake tastes like. This has a delicate coconut flavor — it’s not as pronounced as some of the cakes I’ve made but it’s definitely there. The real star of this show is the fluffy whipped cream frosting and filling. It is incredibly rich and creamy. The frosting looks like vanilla mousse when you are beating it, and honestly, the texture isn’t much different, either. It would actually make the cake too sweet except the tangy raspberry jam just cuts right through and adds a blast of fresh summer flavor. Once you start slicing the cake lay the pieces down flat — don’t serve them standing up. I had layers slipping off because of the height. And, don’t forget to run a straw down the center of the cake to keep the layers from slipping. You can take it out when you are ready to slice it. Oh, and you’ll need to keep it in the fridge. Let it stand about 30 minutes on the counter before slicing it. Don’t even use those recipes that start with a boxed cake mix. Making this coconut layer cake from scratch is so much tastier and really not that much more difficult. You’ll have to whip up some egg whites but you can do that. Plus… 3 layers? No boxed cake is going to give you that. If you are a little unsure of your cake baking abilities check out this post on everything Southern cakes written by a friend of mine. I’m talking about everything you need to know from start to finish, a plethora of recipes, tools you’ll need… EVERYTHING. Just don’t forget to come back here and give this coconut cake a try. Get good cake pans. I cannot stress this enough. Cheap pans don’t heat evenly, they don’t last, and they’re just not that great. I use the Wilton pans with high sides. And for cakes? You know… KitchenAid. Here’s that Southern Coconut Cake Recipe. I know you are going to love it! Triple layer coconut cake with raspberry jam filling and a creamy, rich white chocolate whipped frosting. Beat the egg whites and cream of tartar until stiff but not dry. Stir the flour, baking powder, and the salt together. Mix the milk and the rum. Cream the coconut oil, sugar, and flavoring until well mixed. Add the dry ingredients alternately with the milk mixture, beating well after each addition. Gently fold in 1/3 of the egg whites until it's all mixed in. Spoon into the prepared pans. Bake at 375F for 20 to 30 minutes, or until cake tests done. Let cool in pans for 5 minutes then carefully turn out to cool completely. Beat on high until the mixture starts to thicken. Beat until fluffy and thick enough to spread. Run a ring of frosting around the edge of the first layer. Fill the center with 1/4 cup jam. Add 1/4 cup coconut on top. Top with the third layer and push a straw down the center of the cake to stabilize the layers. Cover the sides and top with remaining frosting. Let sit at room temperature about 30 minutes before cutting and serving. Part of Meal Plan Monday #99 – Check out all the great recipes! That cake looks fantastic! I can almost taste it! I didn’t grow up with coconut cake, but have learned to love it as an adult. Your version sounds light as a feather and simply scrumptious! Wish I could get a slice of the cake in the photo right now. 🙂 it’s so good, Laura. I wish you could share some with me. Holy cow this looks incredible! I’ve been craving coconut like crazy lately. I’ll have to made this for sure! I’m originally from Rhode Island Marye, and have been to Rumford many times. It is a lovely, upscale community. And any cake that has its origins in Rumford is sure to be a winner. I love coconut cake and coconut rum sounds like the crowning touch! 🙂 It really enhanced the flavor…. or I drank enough that the cake tasted extra good — not sure which. this looks and sounds DELICIOUS. perfect for Easter! I am in charge of dessert for Christmas every year and two years ago I made a disastrous coconut cake. My father in law loves coconut cake. I decided to make one for him from scratch. From a recipe that I had never used. The middles of my cakes sunk. I thought I could save it with the frosting but it turned out to be a thin, watery mess. It was the saddest cake I have ever made. I had another disastrous one this year with a chocolate meringue cake. I am going to give this one a shot and see how he likes this one. 🙂 LOL! Be sure to let me know. 🙂 It’s so good. Thanks Catherine! Those look beautiful, well done! Beautiful! I think I’d really enjoy this cake since you said it’s not overly pronounced coconut flavor. Sometimes coconut can be just a bit too much for me. Love the raspberry filling! OMG, this looks so light and fluffy! I love anything coconut! This one will definitely be tried in the future. Marye, your Coconut Cake looks divine! It’s the perfect dessert for celebrating Easter. 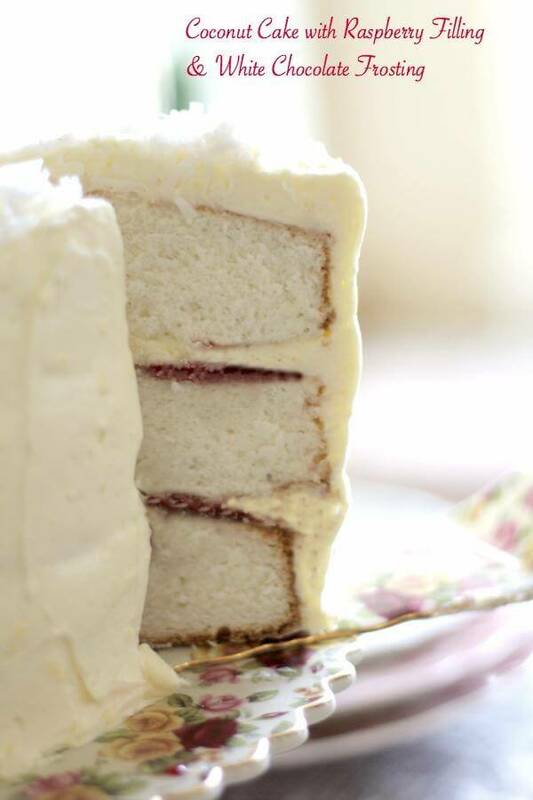 Thanks for linking to my White Velvet Layer Cake. 🙂 Have a wonderful and meaningful Easter holiday! Stacy – I love the look of that cake… I have to say — your blog design is fantastic! This looks absolutely delicious! I loveee coconut so I’ll have to try this out the next time we’re celebrating something! 🙂 Let me know what you think.